In the Northern Cape province of South Africa, lies the beautiful landscape of the Richtersveld National Park. The park is maintained and managed by the locals, they're the ones who keep watch over the park and its multitude of inhabitants. The harsh desert landscape appears to be completely barren at first, but closer inspection will show why this UNESCO World Heritage Site is like nowhere else on Earth. The landscape of the Richtersveld National Park is a diverse environment with high mountains and deep valleys of jagged, volcanic rock. The sharp mountain peaks break suddenly into flat plains of sand, shrubs and earth. While most of the park is comprised of these seemingly unforgiving desert lands, the park is also home to the famous Orange River, which acts as a natural border with the country of Namibia. There are a great many visitors to the park every year; it's a favourite region among the locals and international travellers alike. South Africa is understandably proud of the unique landscape and ecosystem that it has. So what in particular makes this landscape different from any other? During the day, the summer temperatures can reach 53°C, and rain is a very rare thing to find. But apart from the Orange River, the lands depend on another type of water source: fog. Called 'Malmokkies' by the local inhabitants, the thick early morning fog brings moisture across the land, and nourishes the plants and wildlife in kind. The cool nights bring heavy dew, and it is for these reasons that the land prospers under such harsh conditions. 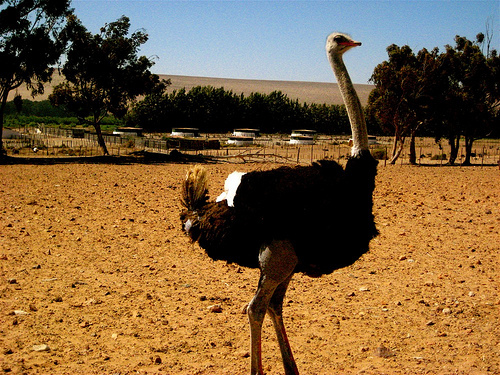 Above: An ostrich is one of the many animals that can be found in the Richtersveld National Park. Due to the incredible ecosystem, unique to the Richtersveld National Park, a whole range of plants and animals survive. Visitors can see an amazing variety of small reptiles, which enjoy the heat of the day. There are outstanding opportunities for keen birdwatchers; with many avian species being completely endemic. The park also boasts a great number of mammals that call it home; there are monkeys, leopards, rhebok, mountain zebras and more. Animal lovers are well taken care of, but botany enthusiasts are also drawn from all over the world to see the range of plant life in Richtersveld. The area is home to approximately 650 species of plant, many of which can't be found anywhere else in the world. The most famous of them is called the 'Halfmensboom', whose strange growth, leaves and trunk make it appear to be half man, half tree! As well as looking after its plants and animals, Richtersveld is also the home to a local community of people called 'Nama'. The Nama, along with other clans and peoples who inhabit the region, are also Richtersveld's carers. The local community actually own the whole area, and they work together with South African National Parks to manage the national park. The nomadic herders still practise their ancient lifestyle in the lands today, and their connection to the land spans over thousands of years. Richtersveld National Park is the only place in the world where this traditional way of life, called the 'KhoiKhoi', still survives today. With a wonderful diversity of land, plants, animals and people, Richtersveld is a place of unparalleled beauty. As well as the cultures and traditions that are completely unique to the area, the botanical life and ecosystem here are also one of a kind. Everything about the national park could take your breath away, so to witness something truly amazing, visit the Richtersveld National Park in South Africa.